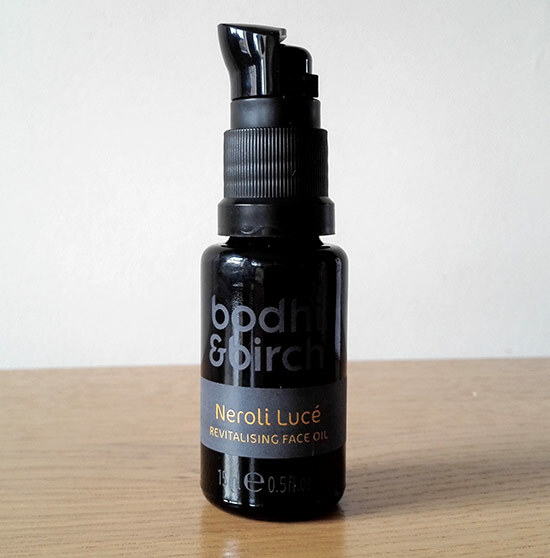 It feels like ages since I finished a bottle of Neroli Lucé face oil from Bodhi & Birch. It was a birthday present to myself actually and I bought it back in December, a few weeks before my birthday! This is the first product I tried from Bodhi & Birch and I totally loved it. It lasted me good two months and in the beginning I only used it in the evening, but then at some point my daily moisturiser ran out and I started using oil in the morning as well. It works very well as a make-up base as it absorbs quickly without leaving any oiliness on top of the skin. This face oil is simply amazing. Packaging looks lovely, I feel like I am unwrapping a little present when I open it for the first time – this is because of a lovely orange ribbon with a label covering the box. Once I open the box I am presented with a little black glass bottle, very dark considering that the packaging is so light, but we are not judging the product design here, so let’s move on. The bottle top is covered with something that reminds me of a helmet from medieval times. I quickly figure out its purpose. It’s to stop you from accidentally pressing on a pump, a great feature for travelling when you have lots of products in a small bag. It takes a bit of time for the oil to come out of the bottle. I keep pressing and for a second I think that I am doing something wrong but then finally, a small amount of oil lands on my hand. I am blown away by its scent. It’s pretty strong, very rich scent and nothing like I’ve ever smelled before. It’s powerful but not unpleasant. It’s kind of floral but I cannot say what the scent exactly is as I am not familiar with it. It’s probably neroli since this is in oil’s name. The colour of the oil is deep orange which is a great sign as this indicates a good quality and a concentration of antioxidants and vitamins which help to improve a complexion. 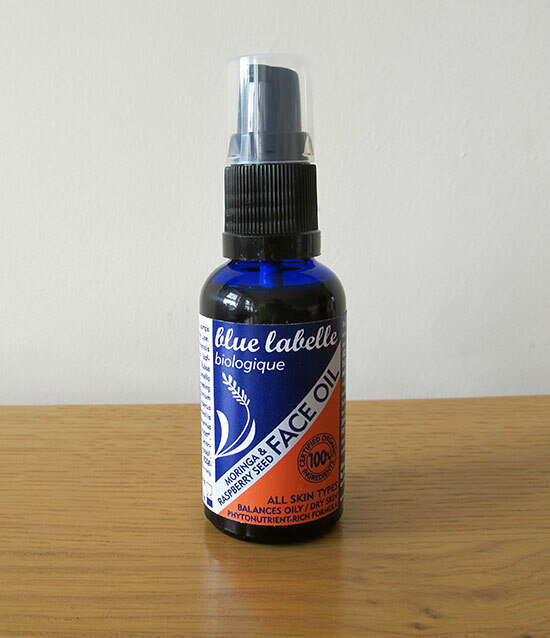 Neroli Lucé Revitalising Face Oil is suitable for normal, combination or blemish-prone skin. Bodhi & Birch also do Desert Rose Rejuvenating Face Oil which is suitable for normal, dry, dehydrated, mature, stressed or lacklustre skin. At £32 for 15ml Neroli oil doesn’t come cheap. It is however worth the money. It absorbs almost instantly, leaving skin feeling soft and hydrated. Once applied, it doesn’t feel greasy to the touch. The make-up can be applied soon after. If you have some pretty dry areas on your skin, I recommend you use a nourishing moisturiser after you apply the oil as the oil may not be enough on its own, especially if you want to apply natural mineral foundation on top. The idea is to apply the oil before the moisturiser anyway but I’ve been using it on its own as I didn’t feel the need for moisturiser. A combination of oils used in the blend will help to rejuvenate the skin, help it to heal, combat wrinkles and dryness and also improve skin’s elasticity. Neroli Luce oil is literally bursting with anti-oxidants, fatty acids and vitamins. No wonder your skin feels so lovely when you wake up in the morning. The main oils responsible for that are: neroli, frankincense, sea buckthorn, grape seed, evening primrose, apricot kernel and jojoba oil. The only downside of this oil is that it’s not certified organic although Bodhi & Birch use organic ingredients in their formulations whenever possible. It would be nice if they were certified as well, especially because the price is already pretty high. Just in case you wondered about Bodhi & Birch. They are British eco-luxury natural bath, body and skin care brand, founded by Elijah Choo. Their products are free of nasties such as parabens, petrochemicals, glycols, synthetic colours and sulphates. They are tested on humans, never on animals. What’s more, each ingredient is ethically sourced from sustainable origins. All in all, I am really happy to recommend Bodhi & Birch Neroli Luce oil. If you want to give it a try without buying a full size bottle you can buy a travel size here. Have you heard of Bodhi & Birch before and have you tried any of their products yet?